Background: Tourette Syndrome (TS) is a neurodevelopmental disorder with childhood-onset, with a typical decline in tic severity, as well as an increasing ability to suppress tics in late childhood and adolescence. These processes develop in parallel with general improvement of self-regulatory abilities, and performance monitoring during this age-span. Hence, changes in performance monitoring over time might provide insight into the regulation of tics in children and adolescents with TS. 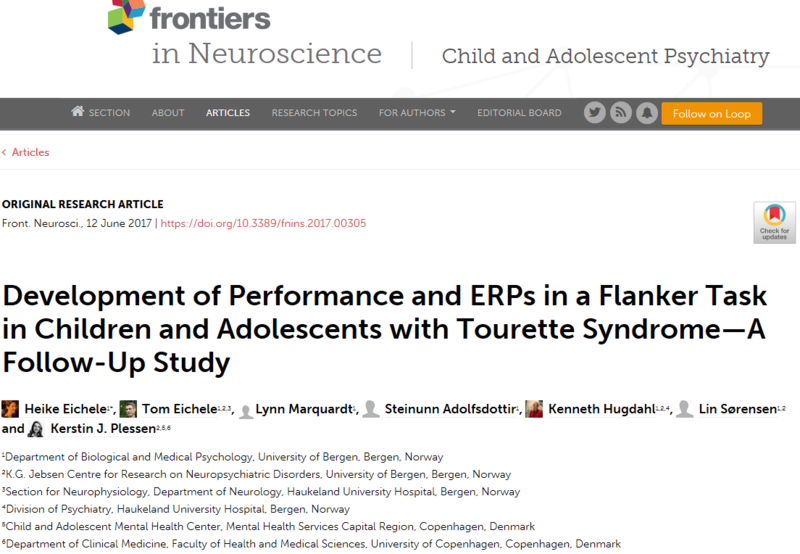 Method: We measured reaction time, reaction time variability, accuracy, and event-related potentials (ERP) in 17 children with TS, including 10 children with comorbid Attention-Deficit/Hyperactivity Disorder (ADHD), 24 children with ADHD, and 29 typically developing children, using a modified Eriksen Flanker task in two testing sessions administered on average 4.5 years apart. We then compared task performance, as well as ERP components across groups, and over time using regression models. Results: Task performance improved in all groups with age, and behavioral differences between children with TS and controls diminished at second assessment, while differences between controls and children with ADHD largely persisted. In terms of ERP, the early P3 developed earlier in children with TS compared with controls at the first assessment, but trajectories converged with maturation. ERP component amplitudes correlated with worst-ever tic scores. Conclusions: Merging trajectories between children with TS and controls are consistent with the development of compensatory self-regulation mechanisms during early adolescence, probably facilitating tic suppression, in contrast to children with ADHD. Correlations between ERP amplitudes and tic scores also support this notion. To investigate the prevalence of insomnia in adults with Attention-deficit hyperactivity disorder (ADHD) and its association with clinical subtypes, current ADHD symptoms, and stimulant treatment. We obtained diagnostic information, symptom rating scales and treatment history from clinically ascertained adult ADHD patients diagnosed according to DSM-IV criteria (n = 268, mean age 38.1 years) and randomly selected population controls (n = 202, mean age 36.5 years). The Bergen Insomnia Scale (BIS) was used to measure insomnia. ADHD symptom domains were self-rated using the Adult ADHD Self-Rating Scale. Insomnia was far more frequent among adults with ADHD (66.8%) than in the population controls (28.8%) (P < 0.001). Insomnia was more common in adults with the combined subtype than in those with the inattentive subtype (79.7% and 55.6%, respectively) (P = 0.003). For self-reported current ADHD symptoms, inattention was strongly correlated to insomnia. Patients currently using stimulant treatment for ADHD reported a lower total insomnia score compared to patients without medication (P < 0.05). Insomnia was highly prevalent among adults with ADHD. The lower insomnia score in patients on current stimulant treatment suggests that stimulant treatment is not associated with worsening of insomnia symptoms in adult ADHD patients.